Let's tackle another prolific grower: rosemary. The upright kind gets leggy and looks scraggly if you don't trim it back occasionally. Give it a sunny spot, and your prostrate rosemary will creep out of its bed and half way across your yard if you let it. Rosemary's resinous undertones go great with nuts. That's why you see so many recipes for rosemary-roasted mixed nuts. Personally, I think it makes the best match for walnuts, and I don't want to go poking around in a pile of peanuts and pistachios to find my favorites. So what I do is melt about half a stick of butter on a rimmed baking sheet in a preheated 350 degree oven. When the butter gets bubbly, drop in a handful of rosemary needles, a few large pieces of fresh orange peel (count them, because you will want to take them out later), a few pinches of salt, and between 1 and 2 pounds of shelled walnuts. If you like things hot, add red pepper flakes or a few drops of Tobasco. Toss this all together, drizzle a little honey over the top, and put the sheet back into the oven for 10 or 15 minutes, stirring occasionally, until the butter turns into a nice glaze. For a quicker savory treat, you can pop popcorn and toss it with rosemary and butter while it is still hot. 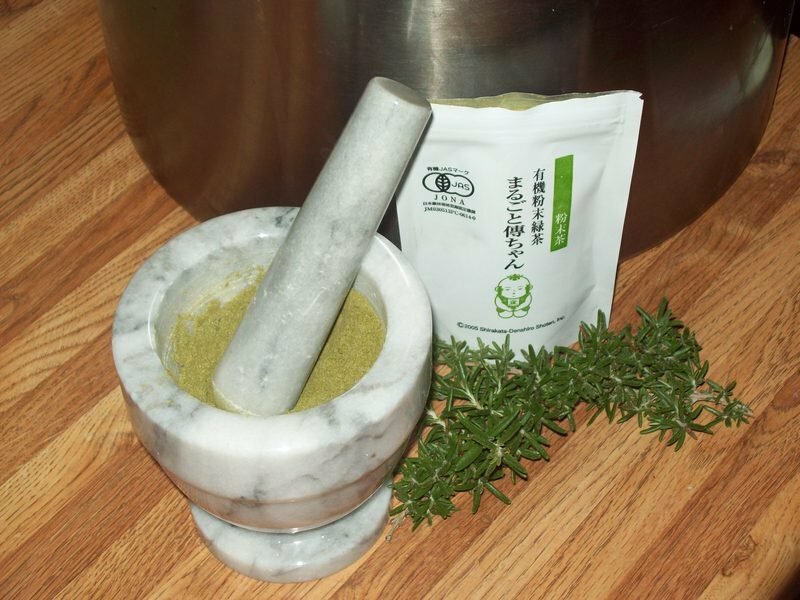 Or you can make a rosemary-infused salt by grinding a cup of salt together with 3 or 4 tablespoons rosemary needles and a teaspoon of red pepper flakes in a food processor or with a mortar and pestle. If you want something more unusual, I like the intense green color and flavor I got from flavoring the salt with equal amounts of rosemary needles and matcha green tea. Keep the extra to use in other dishes. Chefs call these concoctions finishing salts, and you can use them to add color (and an extra kick of flavor) by sprinkling them onto plated food just before serving. Rosemary is a sturdy herb, which makes it easy to infuse into olive oil or vinegar. You just stuff the bottle full of fresh, spotlessly clean, dry sprigs, then make sure you have covered the herbs completely with the oil or vinegar. In a couple of weeks, you have usable, flavored goodness. Remember to follow safety precautions, as modern guidelines don't consider herb oil stable at room temperature. 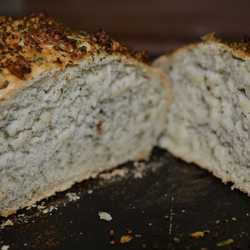 And don't forget to add rosemary to Italian-style breads. Some people like a hint of the herb, while others want double-handfuls of minced fresh rosemary in a single loaf. Rosemary is, after all, a very intense flavor. Experiment and see what works for you. Rosemary and lemon are the classic combination when roasting a chicken. 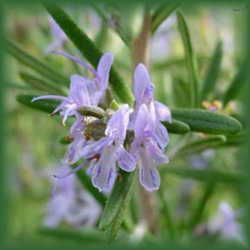 Finely mince a couple of tablespoons of rosemary, a couple of shallots, some lemon thyme and two or three garlic cloves. Work your hand in between the skin of the chicken and the meat to create a pocket, and stuff the herb combination into the pocket. Slice up a couple of lemons and fill the cavity with the lemon slices and a large sprig of rosemary. Mix together about half a cup of honey, a tablespoon or two or balsamic vinegar, and a few tablespoons of Lomoncello. Salt and pepper the chicken, pour the glaze on top and roast for about an hour and a half (depending on the weight of the chicken -- until the leg wiggles freely and the juices run clear). Don't overlook the woody stems that are leftover when you have taken the rosemary needles off. These can work wonderfully as skewers for kebabs - especially of the beef and shrimp variety. The rosemary flavor suffuses through the meat as it cooks. (For a more subtle take on this effect, tie a couple of rosemary sprigs together, and use them as a brush to apply barbecue sauce. The heat releases the plant oils in the rosemary and gives the meat just a hint of rosemary taste. Rosemary works with so many things - beef, chicken, lamb and fish all benefit from it, as do Italian-style tomato dishes, French-style stews and Spanish-style paella. It is a traditional ingredient in boquet garni and poultry seasoning. It can even add an accent to sweet dishes, from shortbread to sorbet. The more you use it, the more uses for it you will think of. 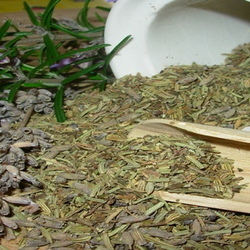 While rosemary is evergreen, don't forget to dry some for spice mixes to give as gifts, and for potpourri. The needles tend to fall off the stem as they dry, so either surround the stems with a paper bag before you hang them in a cool, dry place, or pop them into a plastic bag and put the bag in the freezer for a couple of days. That makes the needles fall off all at once. Shake the bag to release any that have stuck to the stems, then dry the needles in a single layer on a tray.